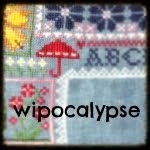 I have a few project updates to show for my May WIPocalypse posting. 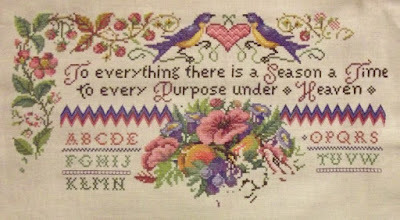 The first is my "To Everything a Season" sampler by Sandy Orton. I managed some good progress on the left side border leaves and flowers, and added a few more letters to my alphabet. I spent some time with "Butterfly Forest", stitching on and around the big butterfly at the top. I still have quite a way to go with this one. 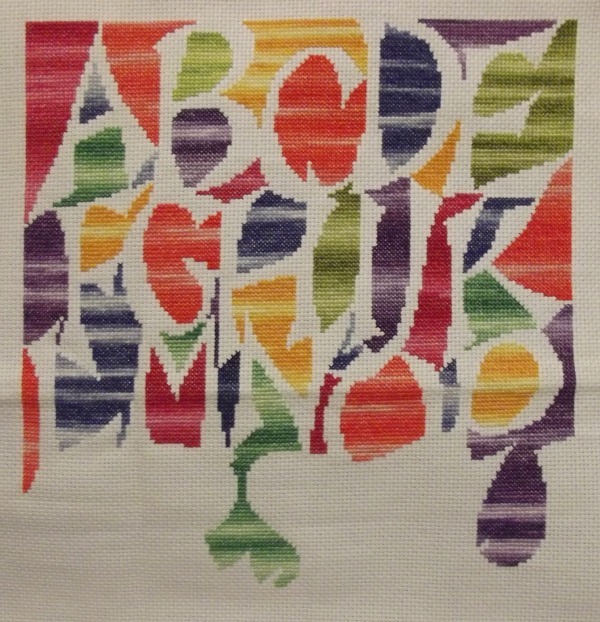 I made more progress on "Multi-Coloured Alphabet". This one is always a nice change from the projects with lots of color changes and blending. Working with variegated thread makes it so easy. And finally ... 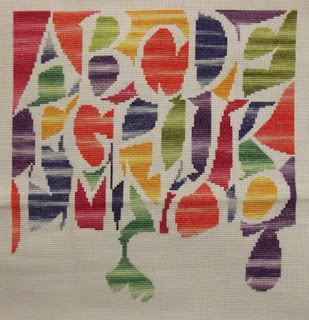 I put some stitches into "American Sampler". 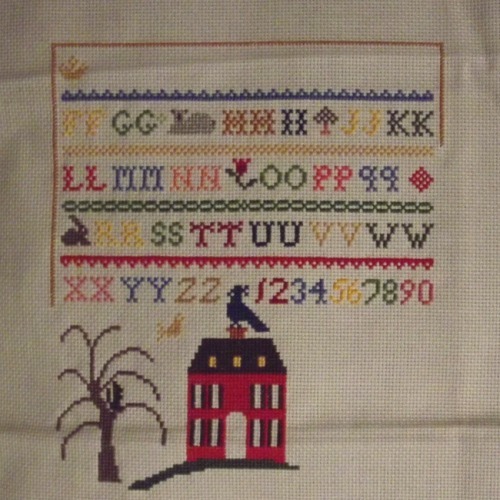 I stitched the little squirrel in the tree, added more of the alphabet, a sheep, a crown, and started working on the inner border. 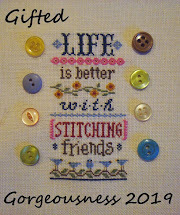 This is another project where I am just using leftover threads from other projects. 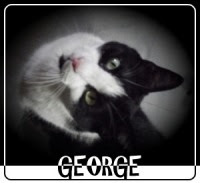 Question of the Month – Talk to us about your longest-running WIP or UFO. I have several old WIPs/UFOs dating back to the 90's. 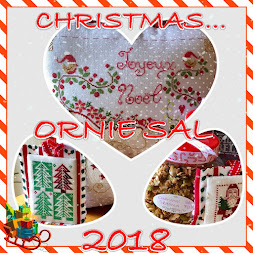 At the time I was very into carousels and carousel horses/animals, so I picked up a few kits (4) and received more kits as gifts (6) ... before I knew it - I had oodles of carousel related projects. Many went into storage when I moved and I didn't get them back out until a few years ago. I am slowly making progress on them, but still have 5 carousel related projects from the 90's lingering in my WIP list. The last one I completed was "Carousel Zebra" in 2014! So many projects ... so little time. *This just brought to mind the old "Twilight Zone" episode, where the man who loved to read but never had time survived the end of the world and found the library. "Time enough at last!" But then he broke his glasses. So all of you WIPocalypse stitchers who survive the Apocalypse better be careful with your glasses and needles! Nice progress. And I remember that episode of the Twilight Zone! Great work, love the Carousel Horse. I have the book of the seasonal carousel horses but have never stitched one! I would just hold the fabric close to my face and ask for perforated paper so I could lick and poke the thread through the holes, nothing stops a dedicated stitcher! They are all looking great, but I really like To Everything A Season and Butterfly Forest! That episode was a sad one - luckily I'm nearsighted so even without glasses I'd be able to see!